An aliyah, honoring the Torah with your blessing when the Torah is read in synagogue, is always an honor. If selected, you’ll want to fulfill this mitzvah (commandment) with dignity, both out of respect for God and Torah, and out of respect for the congregation. Therefore, if the blessing is not familiar to you, it is important to gain familiarity with the ritual of the aliyah and practice reciting the blessing aloud prior to the occasion. Here you will find a complete description to help you. Please keep in mind that there are variations in custom in different congregations, and it is appropriate to follow minhag ha-makom (the custom of the place in which you are). A person who is called up to bless the Torah is said have been granted an aliyah. The word ” aliyah ” is the same word that is used to describe a person who emigrates to Israel (“making aliyah”). Generally, the word means “to ascend.” Emigrating to Israel, and being called up to bless the Torah, are similarly considered to be “elevating acts,” or acts of ascension. It is customary at Temple Beth Torah to wear a Talit (prayer shawl) when called to the Torah. If you are a guest at a bar or bat mitzvah , you will have been informed in advance that you are to be honored with an aliyah . Very likely, you will have been asked to provide your Hebrew name, so that the Cantor can call you up by that name. 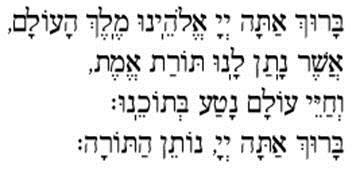 The Cantor will chant a brief phrase in Hebrew, ending with the words, ” Ya-a-mod, (your Hebrew name), harishon (“the first,” or whatever number aliyah you have been granted). There are generally seven aliyot on Shabbat morning. The Rabbi will then call you up by your English name. If you do not know your Hebrew name, or if the name has not been provided to the Cantor, you will be called up by your English name only. Walk up the stairs on the left side (as you are facing) onto the pulpit, and stand on the bar/bat mitzvah’s right. The reader will point to the place in the Torah where the reading will next commence. If you are wearing a Talit , lift a corner and touch it to the Torah in the place indicated. If you are not wearing a prayer shawl, you may use the edge of a prayer book or the wimple (Torah sash). While the Rabbi/reader recites the Torah, it is customary (and your privilege) to hold one of the Eitz Chayim (bottom ends of the wooden rollers). Ba-ruch a-ta A-do-nai no-tein ha-to-rah. Who has chosen us from all peoples and given us Your Torah. Blessed are You, God, who gives Torah to us. Implanting eternal life within all that exists. When you have finished saying/reciting the blessing, kiss/handshake the bar/bat mitzvah, kiss/handshake the Rabbi and Cantor, and move to the other side of the lectern (you will now be standing on the Cantor’s left). Remain there throughout the next reading, and when the next honoree moves to the Cantor’s left, walk back to your seats. It is traditional to say to Torah readers, or people receiving an honor related to the Torah, “Yesher Koach” (may your strength be firm). You may also be told, “Shabbat Shalom,” or “Mazel Tov.” A proper response is always “Todah Rabah” (many thanks), or if it is Shabbat, “Shabbat Shalom” (Sabbath peace).